This is similar to Brinell Hardness test, but in this method the drawback of the flattening of the steel ball in testing harder materials is eliminated. It uses a similar relationship and most of the errors and limitations of Brinell Hardness test are eliminated. In this method of hardness testing a diamond square based pyramid indentor with 136° angle between opposite faces is used. The load varies from 5 kg to 120 kg in increments of 5 kg. Similar to Brinell and Rockwell hardness measuring methods, this method also uses the indentation produced by the indentor (Diamond pyramid). The indentor gives geometrically similar impressions under different loads. The values of Brinell and Vickers hardness are practically the same up to 300. 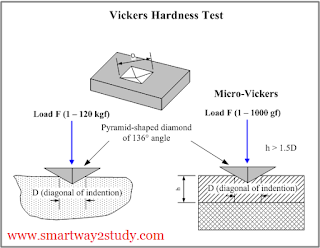 We must note that Vicker's test can be carried out accurately on polished surfaces but does not give accurate results when used for rough surfaces.